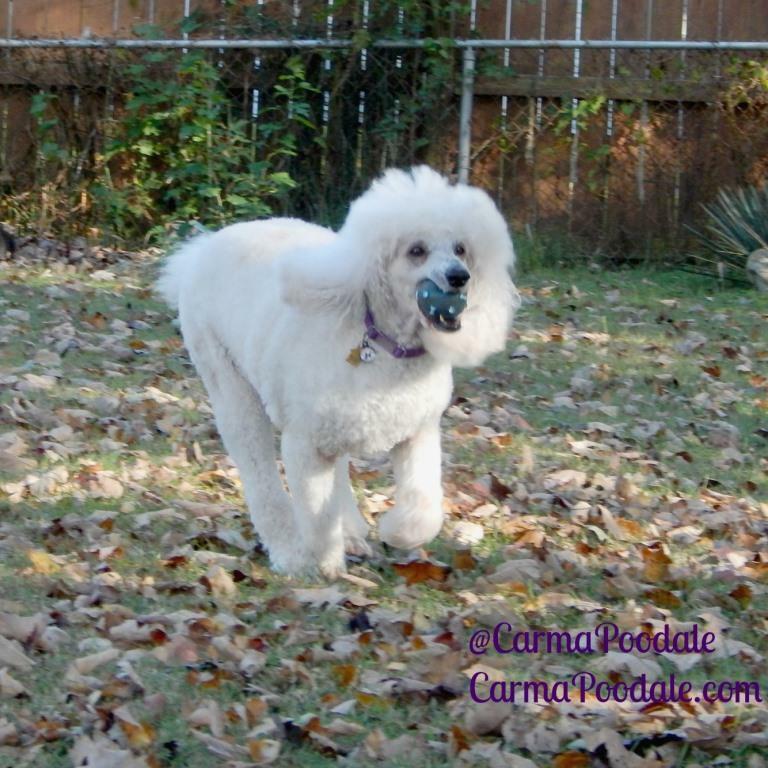 Carma Poodale : Having Fun And Exercising Too! Having Fun And Exercising Too! With the leaves falling and the temperatures getting cooler, we get to go out earlier to play. 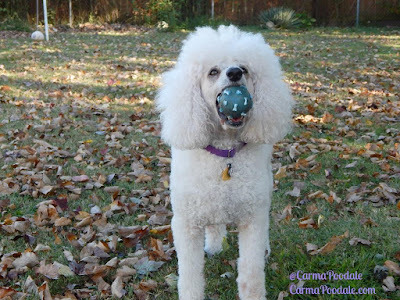 I like it because I don't get overly hot playing poodle ball (fetch) with ma. I could play for hours if her arm would hold out. We look forward to our outdoor time and playing together in the yard. While ma trims her flowers or just sits and relaxes there is always fun being had. I get my exercise by running after my ball and sometimes I even get chased by Molly Mew. Molly Mew has been on mole alert. I think there is a family of moles living along our back fence. 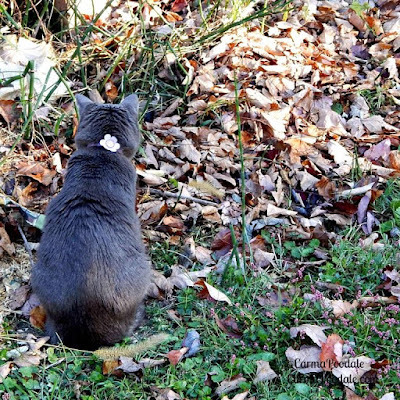 She will sit for hours and watch those leaves. She did bring ma a mole the other day. Ma made her drop it and the mole ran away to safety. 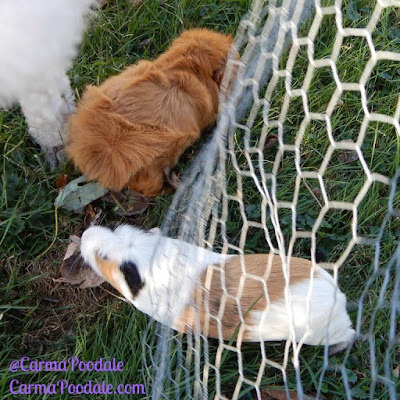 Cinnamon and Cookie, the guinea pigs like to nibble the grass and get fresh air and sunshine. Ma will pick them fresh mint to nibble on too. 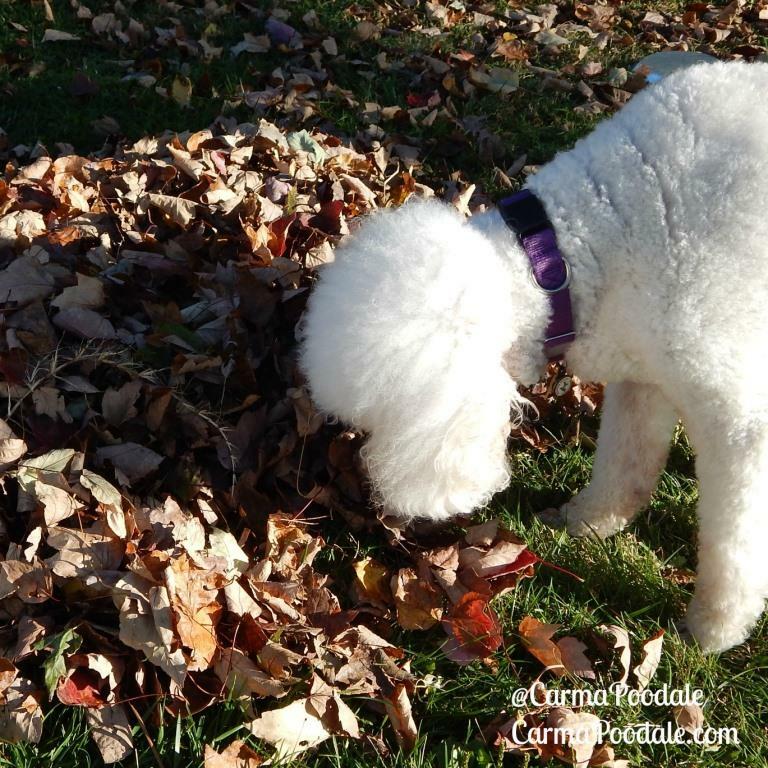 Cinnamon loves to play in the yard. He has plenty of hiding spots and has many surfaces to cross. It helps to keep his nails trimmed. He likes to dig in the dirt or the sand, play under the Pompas grass or climb on the rocks around the pond. One of the things he has found that he really likes to do is play in the leaves. Ma will rake a small pile up and as soon as he sees them he comes running. He barrels through those leaves like a bulldozer. Once he gets in them he roots and rolls. He makes all kinds of noises and every once in a while , I swear it sounds like he is laughing. 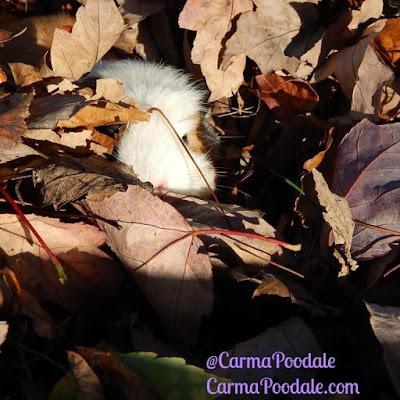 I like to play with him in the leaves. He likes to play hide and seek. While I try to sniff him out, he moves around the pile. I know you are in there Cinnamon! As soon as I stop looking for him he will come out and look to see if I am still there. 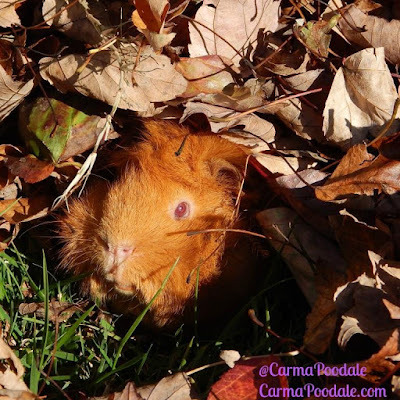 Yesterday Cookie, the foster piggie was watching Cinnamon and me play our leaf game. He was wheeking (guinea pig sounds when happy) so loud and so often that it got her attention. She wanted to know what this game was all about. So she broke out of her caged area to play along with us. Hey, show me how to play that game pwease! 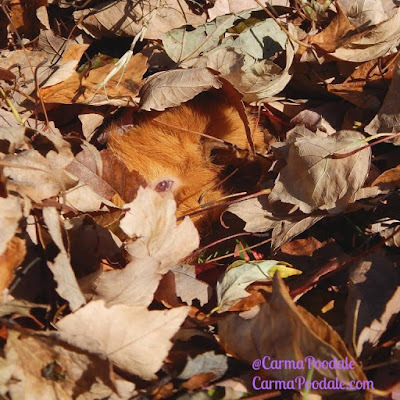 Cinnamon and I took her around to the other side and Cinnamon ran into the leaves. She didn't know what to do at first. Cinnamon kept running in and out of the leaves and she finally followed him in there. Once she got in there she didn't know what to do. Uh, what do I do now? After a little bit, she decided to do whatever Cinnamon did. She followed him in and out of the leaves. He would wheek, she would whistle. It was like they were playing Marco Polo. They seemed to be having lots of fun but the best part was they were getting lots of exercise. That is the great thing about play. You get lots of exercise and its fun. It also burns off a lot of pent up energy and a exercised pet is one that will be less likely to display unfavorable behaviors. 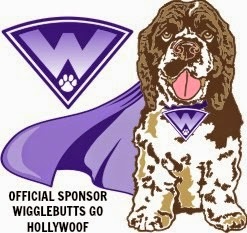 I have to stay in shape because I am a working dog. A service dog is a working dog. The piggies get to relieve any boredom they may get from staying in their cages all day. Molly Mew is much nicer after a few hours outside. Sunshine is a great way to get vitamin D. It really helps to relieve ma's depression. There are always lots of smiles and laughs when we get outside and play together. That is great for depression too. How do you keep your fur family happy and give them the exercise that their bodies need? It's so nice that you have a big yard to play in and lots of friends to play with. Is Cookie going to become a "failed" foster? Ma is thinking about allowing her to go to a guinea pig rescue but hasn't made the final decision yet. We would love to keep her but for her being a SHE and Cinnamon being a male it makes it difficult. We have to have 2 seperate cages and even keep them seperated in the yard. Ma is afraid that we will end up with more guinea pigs. 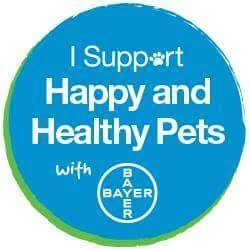 Spaying or neutering a guinea pig is a risky surgery. Some piggies don't make it through a surgery due to the anethesia. We tried to get video of them playing but the dogs in the neighbors yard were barking so much that you couldn't hear all the piggie talk that was going on. I bet if you had a baby guinea pig to take care of that terrier wouludn't kick in. OMD! Are they the cutest!!! 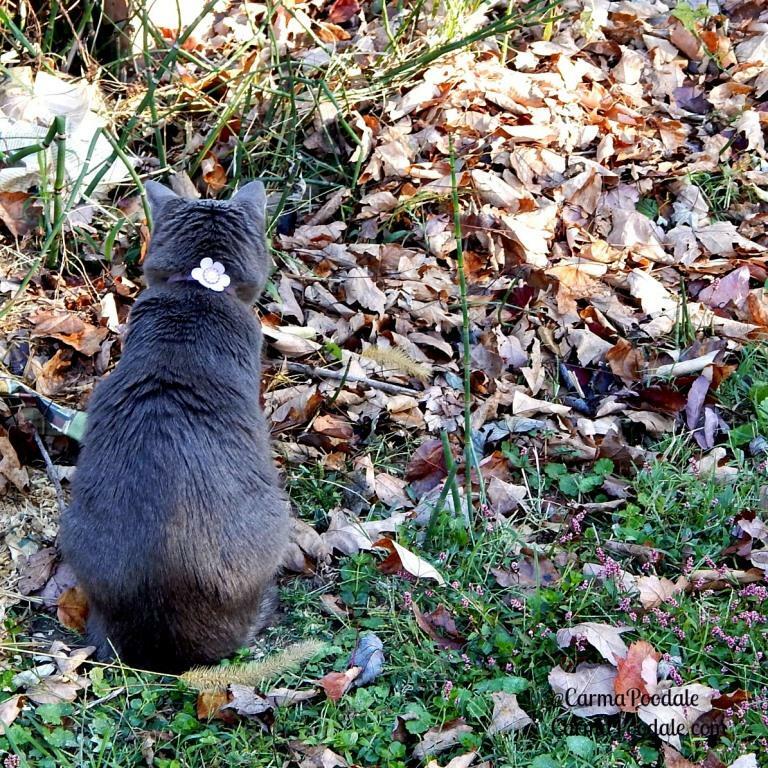 Have fun playing in the leaves!! Thank you! We do love playing in the leaves. They are fun to jump in and roll around in. Have a beautiful day! Love the first photo! Such a happy face! Thank you. Running around playing is one of the fun things to do. I also love walks and working with my ma.